If you are like me you probably spend hours upon hours reading design blogs, e-zines and magazines...ok well maybe you are not, but we all like good design! I LOVE the look of an all white kitchen. ( In fact I have posted quite a few on my kitchen board on pinterest)! And although I drool over marble counters I don't know if I could handle the etching. I do like the idea of it telling a story of the people who live there...but the jury is still out on that one for me. Would you be surprised if I told you it was Formica?!? I sure was! With a 5 foot repeat this is not your grandmas Formica. But what about those black/brown edges and you can't have an undermount sink with Formica.....right??? 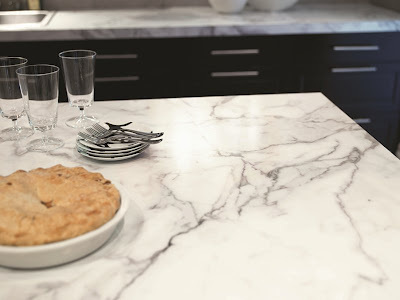 Formica has introduced a new laminate edging technology that allows for softer edging profiles on their countertops, complete eliminating the tell-tale brown line! Also, thanks to their new "Ideal Edge" you can round the corners and ends with ease. And the undermount sink problem? Now she had her counters installed before formica announced the ideal edge, but it is still nice to see the product in real life. So what do you think? 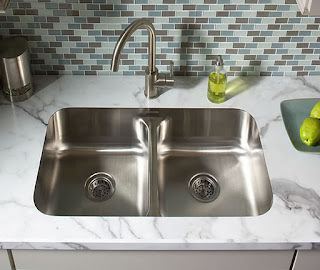 Is this a game changer in the world of countertops? Time will tell, but it is an exciting option and I like a world of options! I know I was really surprised! I love my formica, but would love it more if I had the nicer edge. I ended up hitting mine with white paint and it made it disappear, so it looks nice. But I do intend to use it in my bathroom~and this time with the proper edge. After many months I have to say it is fantastic! Thanks for featuring my kitchen~! Thanks for chiming in Amy! I can't wait to see what it looks like in your bathrooms! What a great alternative for those on a tight budget! Great find! I also made a note of the "Ideal Edge!" I think it is a great option for those on a budget, and especially in rooms where you might not want to splurge on the "real deal." Wow! Who knew? I was just chatting with a client about using formica and she ruled it out due to not being able to use an undermounted sink. May have to revisit this... Thanks for sharing Annie!